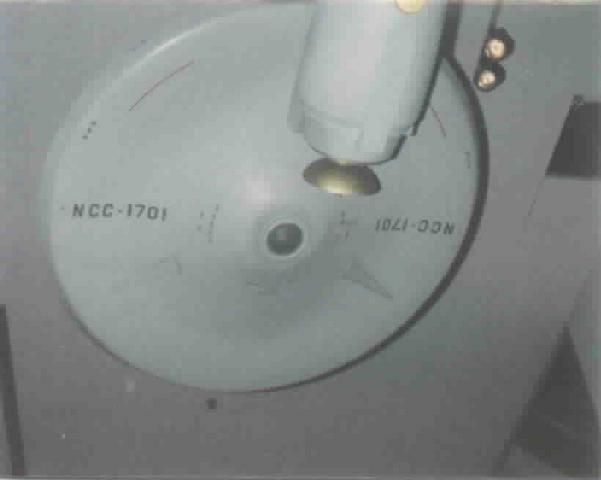 A view from underneath the Enterprise from the original Star Trek series, at the Smithsonian Museum, in 1991. 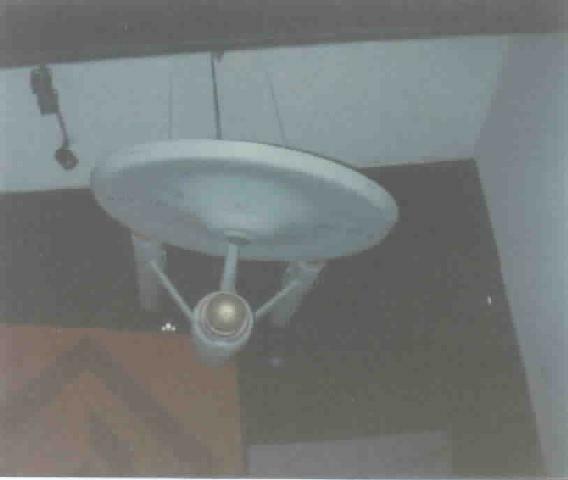 A front view of the Enterprise model, used in the original Star Trek series, at the Smithsonian Museum, in 1991. 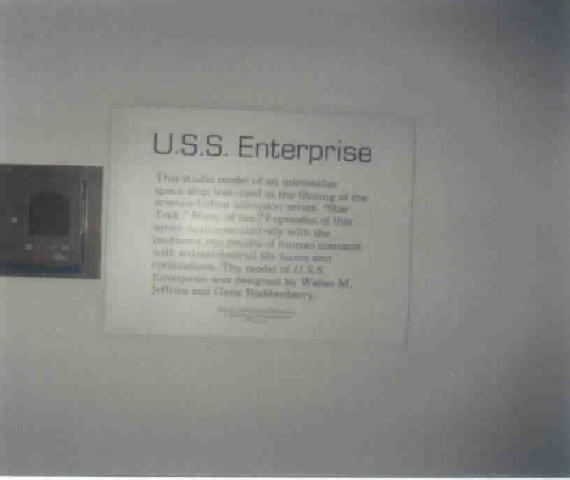 This is a dedication plaque for the Enterprise model. 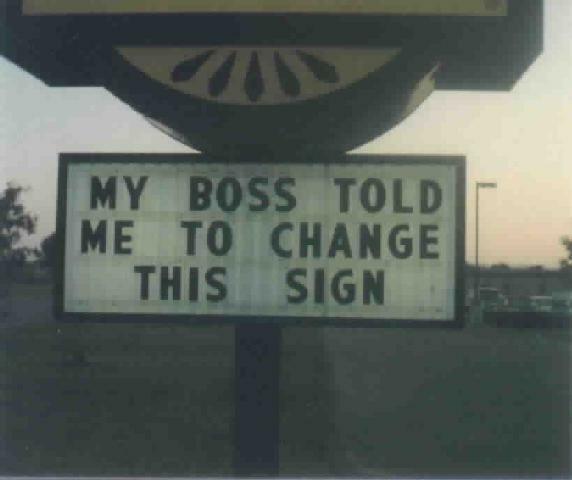 I know, it's kind of hard to read. The text reads: "This studio model of an interstellar space ship was used in the filming of the science-fiction television series, 'Star Trek.' Many of hte 79 episodes of this series dealt speculatively with the problems and results of human contacts with extraterrestrial life forms and civilizations. The model of the U.S.S. Enterprise was designed by Walter M. Jeffries and Gene Roddenberry. Gift of Paramount Television, a division of Paramount Pictures. 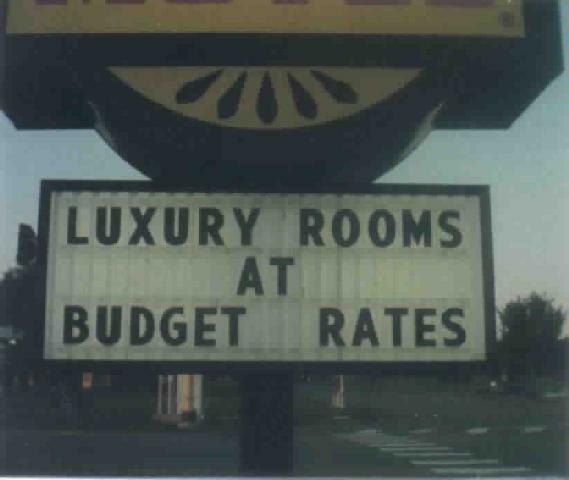 This was taken near Washington D.C. on the same trip in 1991. 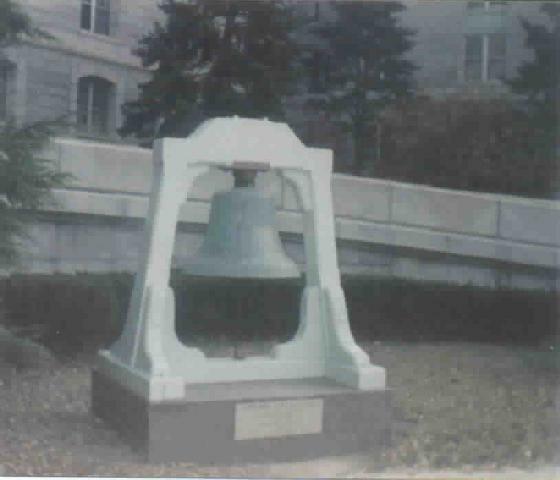 I don't remember much about this bell, except that it was from a Naval ship Enterprise which was struck down many years ago. 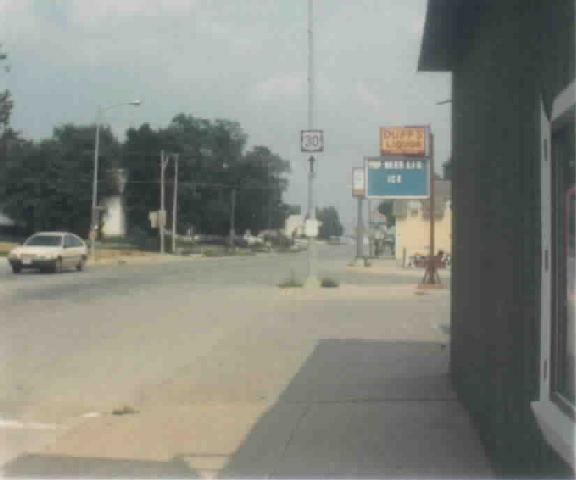 These next pictures will be from a trip we took to Des Moines in, I think, 1989 or 1990. We were going to a Star Trek convention, only my second one at that time. 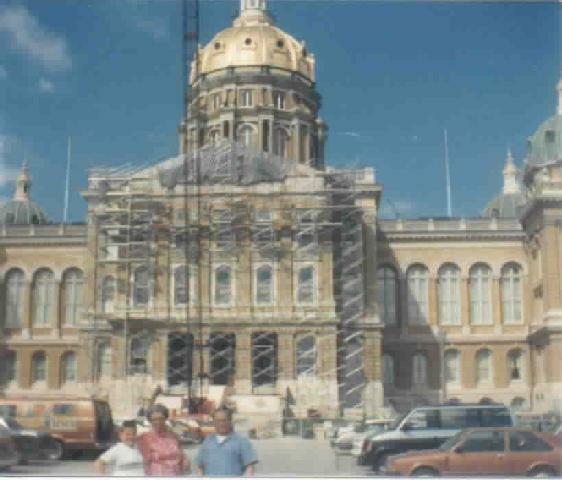 This is the Iowa State Capital building, under construction as always. Pictured at the bottom from left to right are my brother Marty, my grandmother Peg, and grandfather Don. And now, some Missouri Valley. I have not lived in Mo Valley since 1995. That was (as of this writing) six years ago. These pictures were old even then. 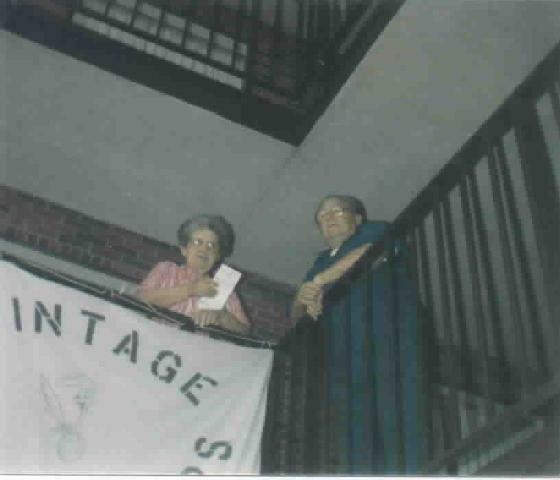 They survived the fire (as did the rest of these pictures) in 1993, so they are from sometime before then. I was standing outside the bar my mom tended work at. No, I don't remember the name, and it doesn't matter, because it's now (at this writing) a Mexican restaurant. 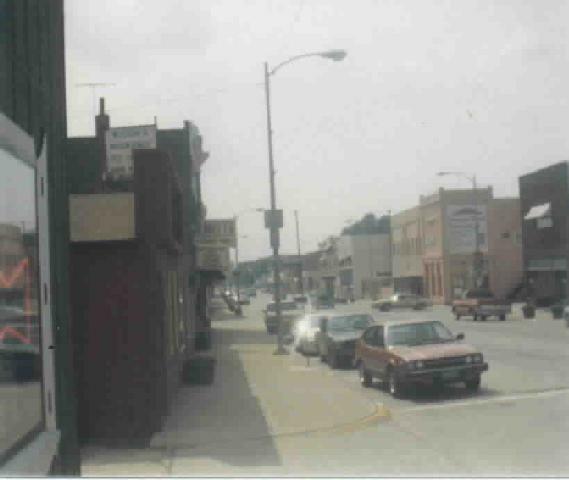 The first picture is a view looking West on Main Street. The building on the far right (mostly cut off) is the newspaper from Missouri Valley. Next to that is Hineline Furniture (the pink building). I don't remember what's next, then there is the Doctor's office, which is only one story. Then there's the alley, then People's State Bank, and finally the Rialto Theater. Difficult to make out, isn't it? Imagine not having been in that theater in six years! The second view is looking East. The Duff's Liquor sign is amusing, considering that it hasn't been there in years. The large empty lot on the left side has for several years now been a low-rise apartment building for the elderly. And finally, two pictures of me. 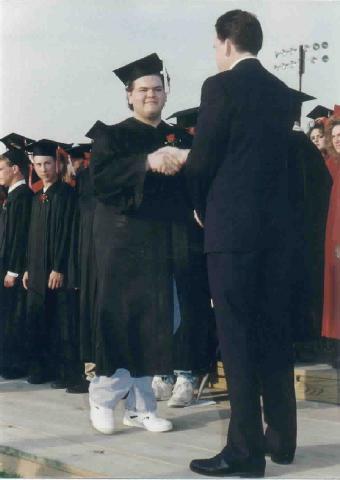 The first picture is me at graduation, in 1993. Note that this picture was taken less than one month after the fire. The second picture is the most recent one I have, with Londo Mollari standing over my shoulder. Appropriate, is it not?